This Aluminum Folding Arched Ramp pair has a 1,500 lb. distributed load capacity and extends to almost 90" to accommodate the loading and unloading of personal equipment. They allow for easy folding, transporting, and storage of the unit and are ideal for lawnmowers, ATV/dirt bikes, and other wheeled garden machinery. Car Top Cargo Car Top Carrier - 18 cu. ft. When you're traveling, you want to relax and enjoy the ride not compete with cargo for space. Heavy, bulky items such as luggage, strollers and outdoor equipment can make your road trip a long one. The Car Top Cargo carrier creates more room for both you and your gear. Durable 4 season high-density polyethylene construction combined with an aerodynamic design helps to reduce wind resistance and aids in fuel economy. The DK2 MMT4X6 single axle 4 ft. x 6 ft. trailer is the perfect solution for anyone needing to pull a trailer behind a small vehicle, full size, lawn tractors or ATVs. This trailer is engineered to provide exceptional balance and ease of mobility with a load capacity of 1,295 lb. It is made from 100% welded tubular steel with expanded steel decks. The back gate is multi-purpose and can sit flat in the bed, up in a vertical position or lying down as a ramp for easy loading. The DK2 MMT5X7 GALVANIZED single axle multi-utility trailer is one of the most versatile trailers on the market. Sitting on a solid square tube cambered axle with 12 inch. radial tires, and a load capacity of 1,639lb. When the front and back load-bearing gates are down, the trailer bed extends to nearly 11.58 ft. Another great feature is the tilt/dump capability that makes it easy to load or unload heavy items. Fabricated from 100% steel, all of the components are reinforced, adjustable, removable and / or interchangeable. The DK2 MMT5X7 with DRIVE UP GATE is a single axle multi-utility trailer and one of the most versatile trailers on the market. Sitting on a solid square tube cambered axle with 12 inch. radial tires, and a load capacity of 1,639lb. When the front and back load-bearing gates are down, the trailer bed extends to nearly 11.58 ft. Another great feature is the tilt/dump capability that makes it easy to load or unload heavy items. Fabricated from 100% steel, all of the components are reinforced, adjustable, removable and / or interchangeable. 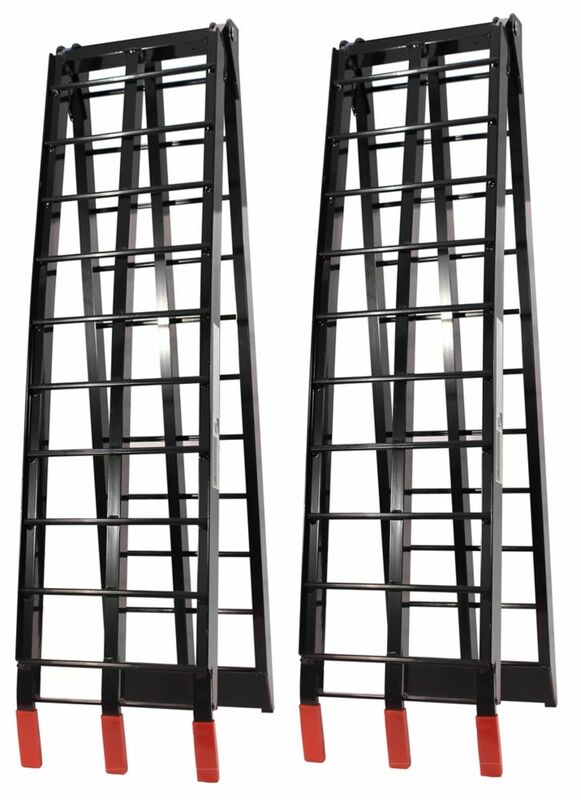 Folding Aluminium Ramps (Black) This Aluminum Folding Arched Ramp pair has a 1,500 lb. distributed load capacity and extends to almost 90" to accommodate the loading and unloading of personal equipment. They allow for easy folding, transporting, and storage of the unit and are ideal for lawnmowers, ATV/dirt bikes, and other wheeled garden machinery.